I’ve discussed how the home video version of Young Indiana Jones was assembled and reassembled, remade and remodelled, from a variety of sources. The Princeton installment is the most curious of them all. I think that the episode was mostly filmed in 1996, but the key pieces of the story were made about two years previously. When the old Family Channel ordered the four Young Indy movies, they got three with Sean Patrick Flanery and a fourth, called “Travels With Father”, which contained a pair of Corey Carrier adventures. These stories were given a framework of Indy coming home from Europe and attempting to mend things with his father, who honestly couldn’t care less whether he came back or not. I think that by the time the Family Channel finally got around to airing “Travels With Father,” the bigwigs at Lucasfilm had already decided to rebuild the series into the current format. So among the new stories made for home video is this big expansion of the frame story. They brought back Robyn Lively for a single scene as Indy’s high school sweetie Nancy. They probably filmed her scene in the newly-made bridge between that story and the Pancho Villa one the same day! Sadly, Nancy doesn’t seem to have got the chance to run off and have high school spy and detective adventures without her no-good ex-boyfriend Indiana Jones. We learn here that she married Indy’s rival Butch and already has a kid. The bulk of the story is another doomed romance for our hero. He falls for a society girl named Amy, played by Brooke Langton, who was one of the ensemble cast of Melrose Place around this time. He also rekindles an old friendship with Paul Robeson, and gets to attend Robeson’s commencement from Rutgers, where, as valedictorian, he gave an electrifying speech about race in America. Kevin Jackson plays Paul, and he’s pretty awesome in the part. And Indy gets a glimpse of the future by working as a lab assistant to rocketry pioneer Robert Goddard, because of course, Indiana Jones has to meet everybody. 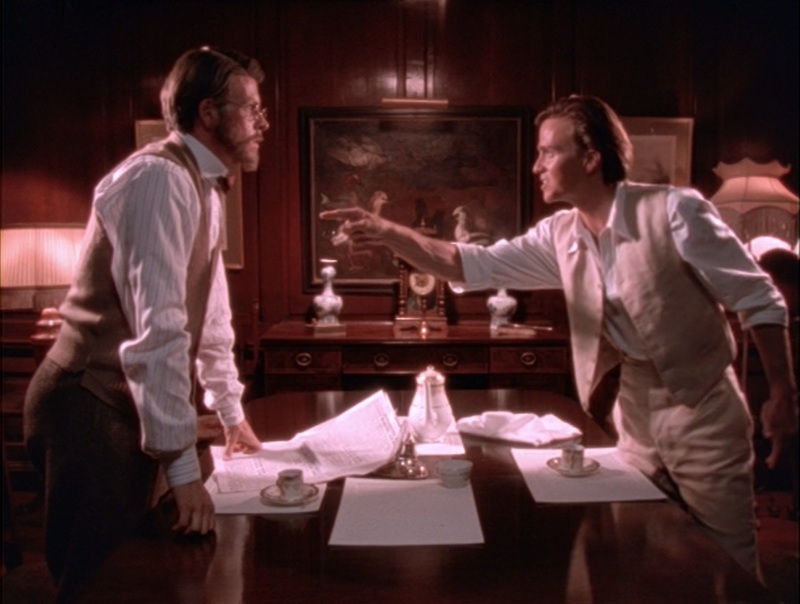 The rest of it’s entertaining – and we all enjoyed Indy and Paul ladling out the fisticuffs against three racist goons who get in over their heads in a big way – but the meat of the story is Indy’s doomed relationship with his father. It’s absolutely heartbreaking. We know from the film The Last Crusade how this is going to end, but seeing Indy leave Princeton, probably never to return, doesn’t make it any easier.